There are some things we do most weeknds, so familiar to family life that I don't often think to take much notice of the details, let alone photograph them. Visiting the local park is one such thing. And thats the nice thing about school holidays - its like one long weekend where there's plenty of time to enjoy these ordinary activities, to slot them into a relaxed day if the mood takes us. Four-fifteen pm, and there it is :: that small space in the day when I don't quite need to start cooking right away and the Little People hit with a whining "I'm Booooorrrred". A glance out the window and I see the sun is shining so without a thought we pull on coats, grab a football and go out to enjoy the park. 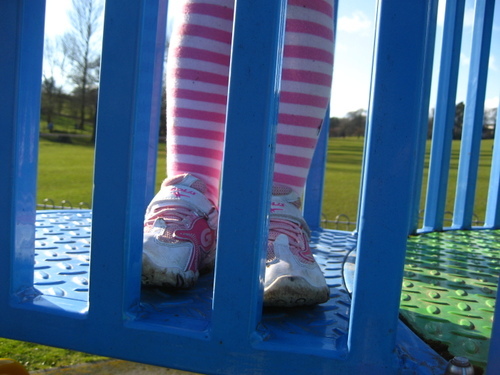 Pink stripey legs run, climb, balance, swing, slide, pause for rest. Denim legs run, kick, run, kick, run, kick, jump, and run some more. Boundless energy. And when the clock ticks round to 5pm I begin the persuasion to make our way home, back up the grassy hill to the trees. Pause to catch breath and look back at the view. 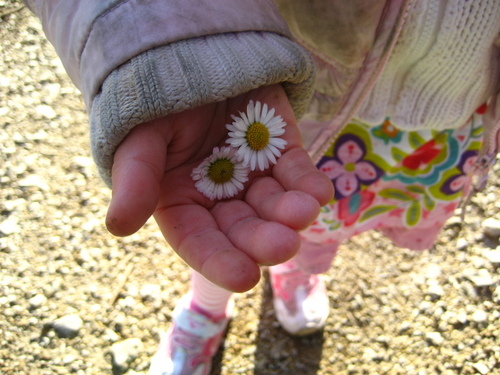 See what we can find along the way....ohh look Mummy, these are for you. 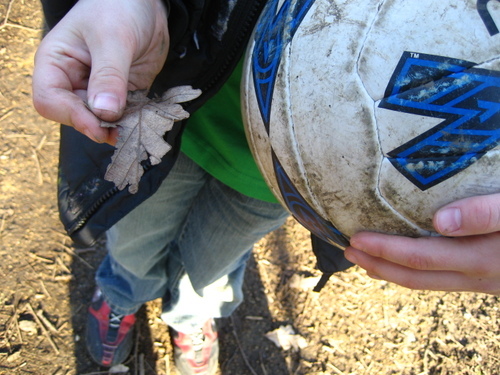 And an old oak leaf too. I'm liking the way that blogging makes my eyes wider and somehow makes me see more, appreciate more. The little details that make up the whole. And it feels good to really like what I see of my ordinary day to day life. "this is happiness.... that moment when you look at your own lifes ordinary "stuff" and LOVE IT!!! Love those moments!" Ah how lovely. I've clicked through from your more recent Sunday walk post. The ordinary things now will not be on the future, I suppose that's the thing. Life moves on and we change. 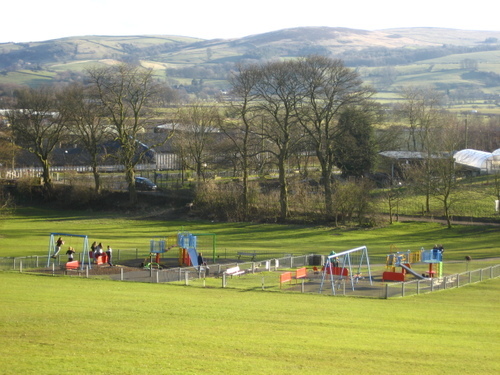 The playground is in a beautiful setting. Maybe what we see as our 'ordinary lives' other people aspire to. I think it looks as though you have a wonderful 'ordinary' life. I think blogging has also made me challeng myself to write better, observe more and find the best things in my day. 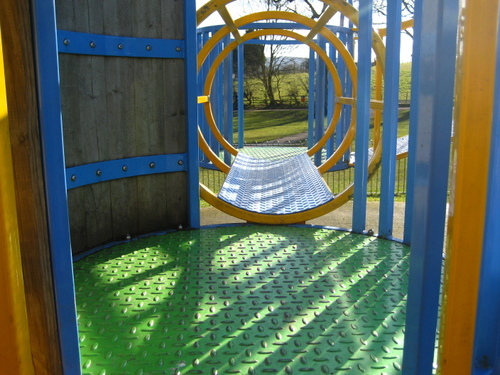 Nice playground by the way. Even though I don't have a blog of my own, reading others' blogs have made me really stop to appreciate my own life and the ordinary little things we take for granted. I've started taking photos of some of those things to put in scrapbooks (that I will someday make for each of my sons). Glad you're enjoying your holidays! I can't tell you how much I want a pair of pink stripey tights! That is just too cute. It looks like they enjoyed the park and their little finds on the way home. What spectacular views you have. I'm loving your school holiday posts. Maybe I should do my own - today I rejoiced at being away from my insane class and vile colleagues - I think that would sum it up on a daily basis!